Prohibition is the ban of making, selling and transportation of alcohol. It was enforced in the USA between 1920 and 1933. From the establishment of Christian faith European colonies in the 17th century, religious ideology has always played a large part in American society. Included within this was the notion that drinking alcohol was a sin. Although advocated by only a minority, such ideas did have voices in the church and political life. 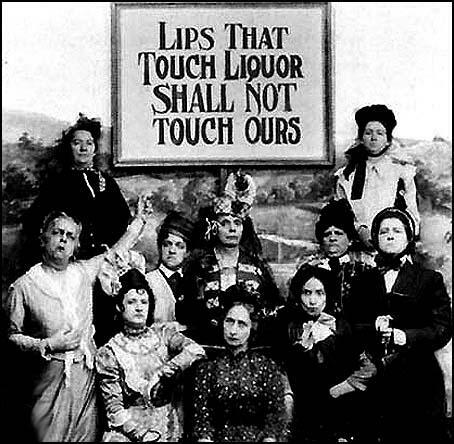 ‘Temperance movements’ – campaigns to have alcohol banned – grew from this, although religion alone would not be enough to dissuade Americans from drinking. It was in the 19th century that temperance became mainstream, supported by key members of society. One of these was women, many of whom saw alcohol as destructive to the family unit. With 1 to 2 million Americans part of a temperance movement by the mid-19th century, there started to be some political action. Some states started regulating minimum alcohol container sizes to stop personal drinking and, in 1846, Maine became the first state to ban the sale of alcohol completely. However, there are theories that darker forces were behind the move from occasional state laws to a full nationwide ban. In the 1860s, saloons were a major part of American working class life (there were over half a million in the country) and it was here that blue-collar workers met to discuss ideas and politics. Insecure about such a mass of the population sharing opinions, the theory is that industrialists and the political classes saw temperance as a tool to break apart this portion of society and its political clubs. Under the guise of cleaning up society, saloons and the working class were targeted. Whether or not politic and industrial policy sought this outcome, by the turn of the 20th century the push for prohibition was stronger. The Anti-Saloon League became a nationwide organisaton in 1895 and quickly established itself as a major lobby group. 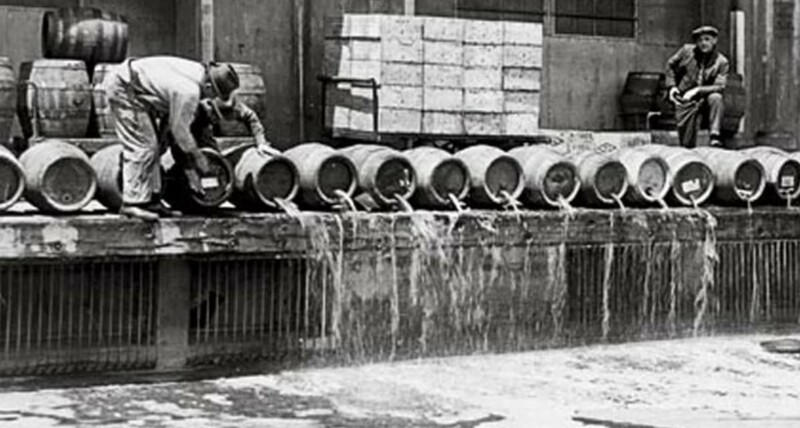 When World War I broke, a new reason for prohibition arose: the need for resources and an efficient, sober workforce. At the end of 1917, the 18th Amendment of the US Constitution was proposed in which prohibition would become legal. It became law on January 16th, 1920. Enforcing prohibition was given to the Internal Revenue Service (IRS – usually responsible for taxes) and then the Justice Department. Unfortunately for the Justice Department, it proved to be an almost impossible job. 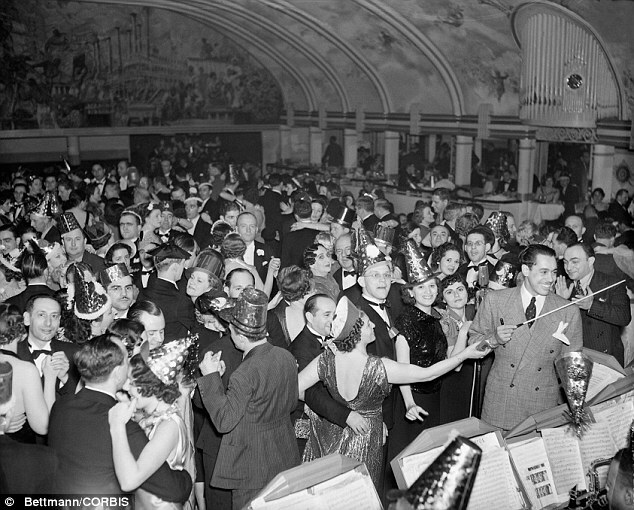 Banning alcohol simply made people make it illegally (bootlegging) and consume it in hidden locations (speakeasies, which were bars entered via code words). Worse, with so much of the population against the idea of prohibition, the attitude towards the Justice Department turned negative. With this in mind, the Justice Department found it was easier to enforce prohibition amongst prohibition-supporting parts of the country. The people in such places were already less likely to drink, and were the most likely to celebrate any action or arrests. Despite a few displays of force, many urban areas were simply allowed to continue drinking as long as they did it out of sight. It is debatable whether drinking actually decreased during prohibition at all. Perhaps the worst problem for the Justice Department was corruption within its ranks. Alcohol producers and sellers had access to money, and plenty of officers were willing to accept some of it to not look too closely at illegal activities. Unsurprisingly, the belief that prohibition was attacking the poor, and the discrepancy in how the law was enforced, made some argue that the whole issue was grossly unfair. One of the biggest complaints was from working class people who no longer had their saloons but were aware the wealthy had private supplies (the Washington Post newspaper suggested 80% of US congressmen and senators drank, whilst bootlegger George Cassidy said he had illegally supplied Congress for 10 years). As well as money being able to bypass the law, there were also religious loopholes. Alcohol was still allowed for religious purposes (sacramental wine), meaning people could continue to buy alcohol if they could supply a religious reason. 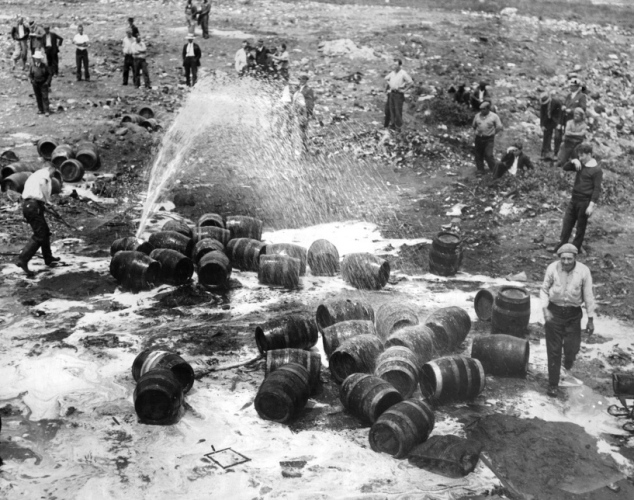 With such problems, government and senior figures believed the unpopularity of prohibition made many people dislike and ignore the government more than before. The most famous problem rising from prohibition was organised crime. By shutting down all legal ways to get alcohol, but not being able to control the demand for it, the law left a huge gap for a black market. Gangsters quickly filled this, and did so in a diverse way. Criminal gangs would have their own speakeasies, distill alcohol to sell to speakeasy owners and private purchasers, and create protection rackets. 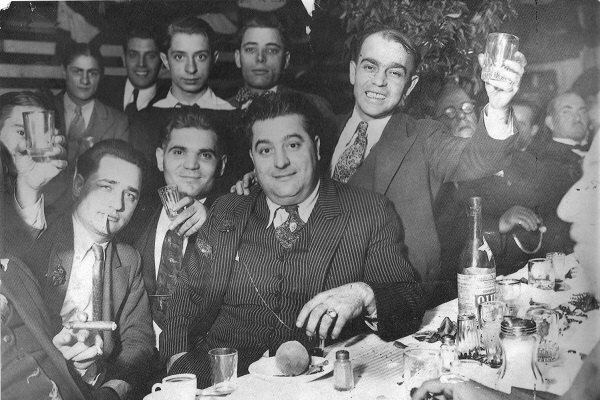 Many legal clubs were replaced by those run by gangsters, and some of America’s most famous criminals, such as Al Capone, made fortunes during this time. With prohibition beset by problems and complaints, and trust in the police and government tested, the US government decided to try bring the law to a close. 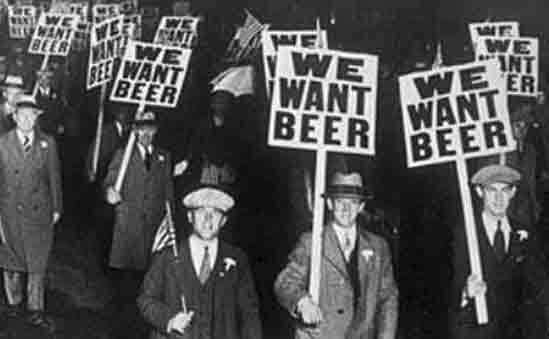 On February 20th 1933, Congress proposed the 21st Amendment, which would annul the 18th Amendment. For the only time in US history, the Constitution was adapted by state ratification: each state had one vote, and to make the Amendment into law required 3/4 of the states (36 of 48) to agree. During 1933 the States made their decisions and on December 5th, 1933, Ohio, Pennsylvania and Utah voted ‘yes’, bringing the number to 36. Only two had voted ‘no’ (North Carolina and South Carolina). Two more states duly voted ‘yes’, and the remaining 8 did not bother to hold their vote. However, this was not the complete end of prohibition: the law now made it each state’s right to decide whether it wanted to continue with the idea based on ‘blue laws’, which allow states to create regulation based on religious standards. For prohibition, a select group of southern states continued statewide alcohol bans until falling to public opinion (Mississippi was the last to end prohibition, in 1966). However, blue laws continue to shape America: Kansas did not allow bars until 1987, while several counties and states still ban alcohol sales on Sunday. Upon repealing the Prohibition Act, Roosevelt declared “What America needs now is a drink”.